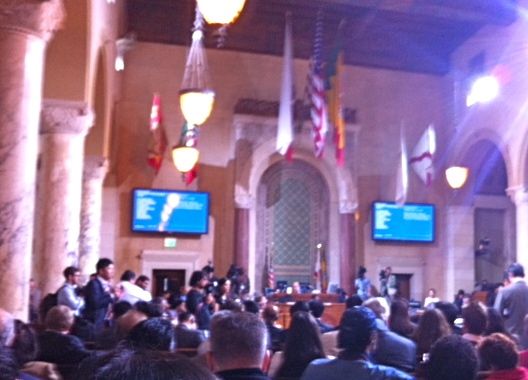 October 25, 2011 was Los Angeles’ First Annual Nonprofit Day at City Hall. In a packed City Council Chambers, Mayor Antonio Villaraigosa and the L.A. City Council spent an hour singing the praises of L.A.’s nonprofit community. Unfortunately, the pomp and circumstances presentations served as a prelude of demonstrating how much the City Council truly appreciates tenants’ rights nonprofits and the people they serve, when they then voted to saddle L.A. renters with a huge housing code enforcement fee increase. The issue before the City Council was a Systematic Code Enforcement Program (SCEP) fee increase from $35.52 to $43.32, representing a 22% increase and a proposed Rental Unit Registration fee adjustment from $18.71 to $24.51, representing a 31% increase. 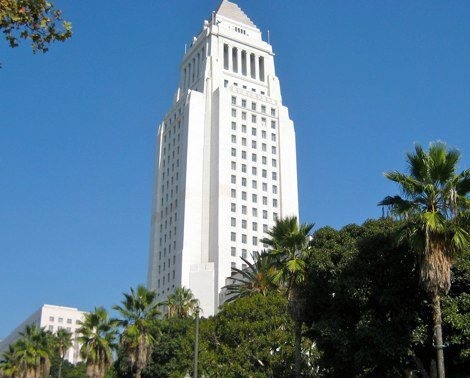 The Los Angeles Housing Department (LAHD) says it needs the increase in order to prevent a deficit and to enable the Department to maintain the current operations and services of the Code Enforcement, Rent Stabilization, and Compliance Divisions. SCEP, established in 1998, is designed to routinely inspect all residential rental properties with two or more housing units on a four-year cycle and to respond to reports of housing code violations. Inspections of 720,000 units are conducted to ensure the safety and habitability of all occupied rental dwelling units. Tenants groups, including the Coalition for Economic Survival (CES), were on hand not to oppose the fee increase, which will help continue the crucia l operations of the Housing Department, but to oppose the inequity of who pays the SCEP fees. Currently, landlords can pass on the full SCEP fee to tenants. The tenant groups were supporting a motion introduced by Council Members Richard Alarcón and Ed Reyes that would divide the SCEP fee payment 50/50 between landlords and tenants, similar to the Rental Unit Registration fee. With a movement calling for economic justice spreading across our nation, with City Hall being ringed with tents filled with people demanding action, with this City Council voting to support Occupy Los Angeles which embraces these economic justice imperatives, one would think that supporting a 50/50 SCEP fee split should be a slam dunk. Sadly, this is not the case. 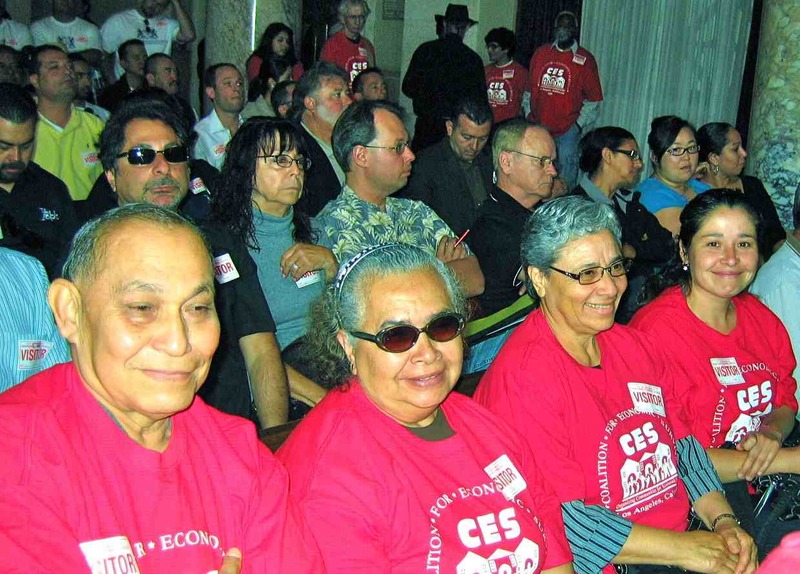 CES believes it is unjust for tenants, who can least afford it, to bear the full financial SCEP burden. There shouldn’t have a city policy where Social Security dependent Westlake renter Dolores Lane, having $250 left to live on after paying her rent, has to pay the full SCEP fee while multimillionaire landlord Donald Sterling pays nothing! Everyone should be paying their fair share. While Council Member Bernard Parks, the voice of the Apartment Association on the City Council, pushed back efforts to split the SCEP fee, he was strongly countered by Council Member Richard Alarcón who valiantly fought to gain support from his colleagues by arguing that dividing the SCEP fee will provide badly-needed balance. However, the 50/50 fee split failed by a vote of 8 to 5 with Council Members Parks, Perry, Zine, Cardenas, Englander, Wesson, Krekorian, and Rosendahl voting to deny tenants equity and Justice, while Council Members Alarcón, Reyes, Huizar, Koretz and Garcetti voting in favor. Council Member Tom LaBonge was absent. The overall fee increases was approved on a 11 to 2 vote. And, to add insult to injury, the vote occurred without public testimony from tenants and their representatives, as well as landlords. The proposal, 11-1488 seeks to raise money for the City of Los Angele’s Housing Department, rather than to bring about a balance between the cost of rent for the tenant and fair return for the landlord. The initial SCEP fee and Registration fee became law and policy because rents were relatively low and these pass through fees were seen as a means to offset operating costs for the owner, hence the “fair return” policy. Again, the ordinance is to protect from excessive rent increases by the landlord, while at the same time allow landlords a reasonable return visa via Registration Fees. Since 2000 Rents have doubled in L.A. Have owners proven up they are not making a fair return? I’m sure this same scenario will be played out across the country. Affordable Housing now has an increase to deal with. Here it becomes more than clear, who the ordinance is focused to help. What I really want to see, when Landlords raise the rents (and they will) is it only to protect or improve the ROI? When a large percentage of the occupancy is subsidized (pretty much guaranteed money) should there not be something on the other end to control this “profits” use? There are no tenant’s rights. I had my apt torn apart for a year…endless notices that were no shows, work done in two hour intervals leaving a mess and ruining appearance of apt per repair. I ended up doing most of the work, paying for things that I should have never paid for, and still got charged a monthly fee. You can not get repairs done, building lessens with amenities per each year….and I have paid a fortune to keep my apt maintained after damage caused by neglected plumbing issues and mold.